A mouse is one important weapon specially in the gaming world. Depending on your mouse, it may lead you to victory or it may lead you to your defeat. 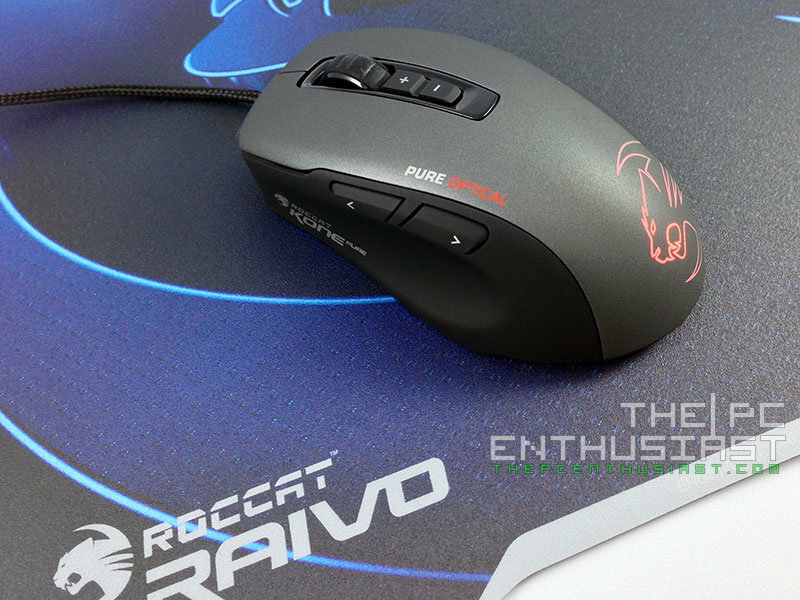 Today let’s take a look at one of Roccat’s gaming mouse – the Roccat Kone Pure Optical; together with a matching gaming mousepad – the Roccat Raivo. 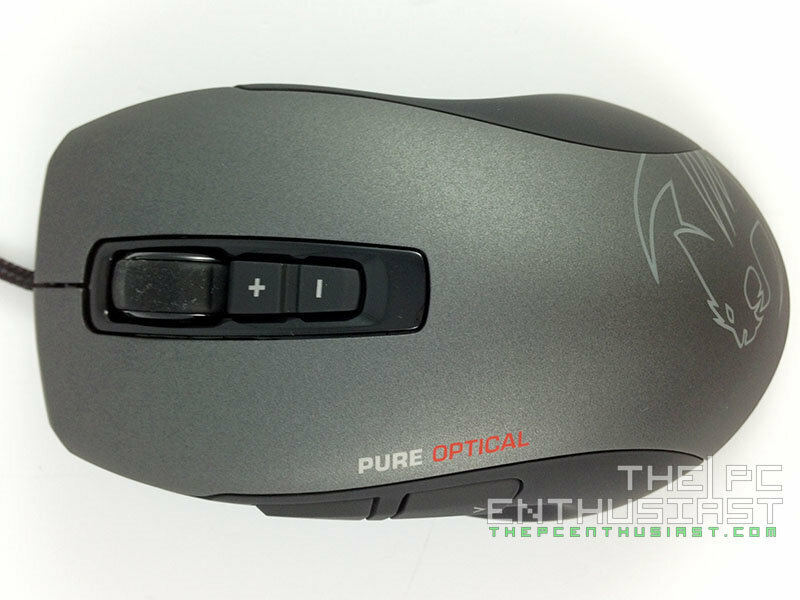 The Kone Pure Optical is one of the company’s core performance gaming mouse featuring 4000 DPI Pro-Optic (R3) optical sensor for ultra-precision and made from highest-quality components. 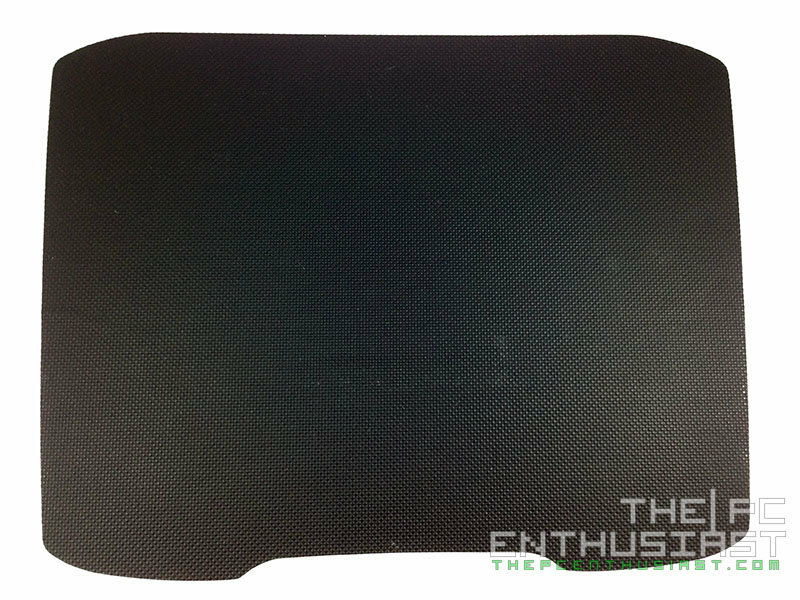 Meanwhile, the Raivo is a super slick high velocity gaming mousepad featuring 3 different layers; a micro-granular surface, support plate and non-slip rubber base. Let’s find out more about the Kone Pure Optical and Raivo in my review below. 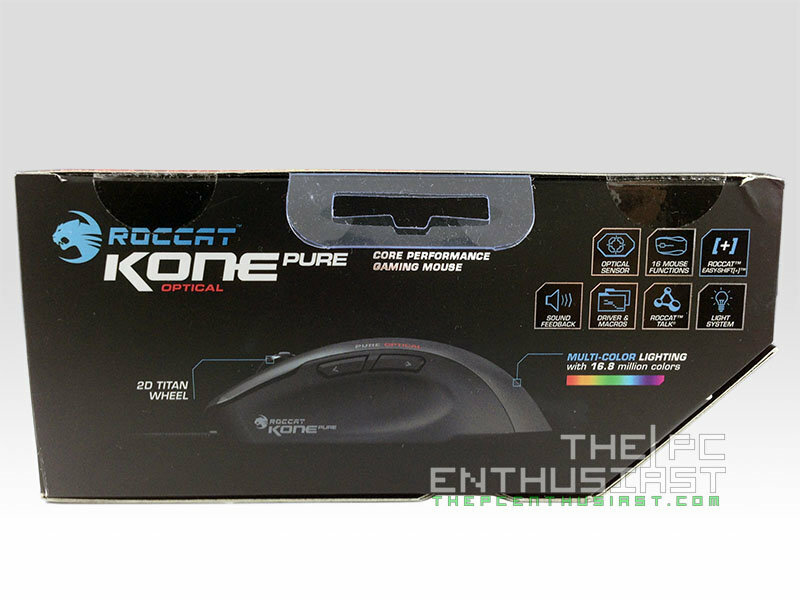 The Roccat Kone Pure Optical features an adjustable 4000 DPI Pro-Optic (R3) sensor that can be adjusted from 400 DPI up to 4000 DPI. It’s powered by a 32-bit Turbo Core V2 processor paired with a 576KB on-board memory making it possible to configure this mouse in several different ways. It’s built with the company’s Click Master switch tech powered by Omron© ensuring that every click or press of a button gets registered. 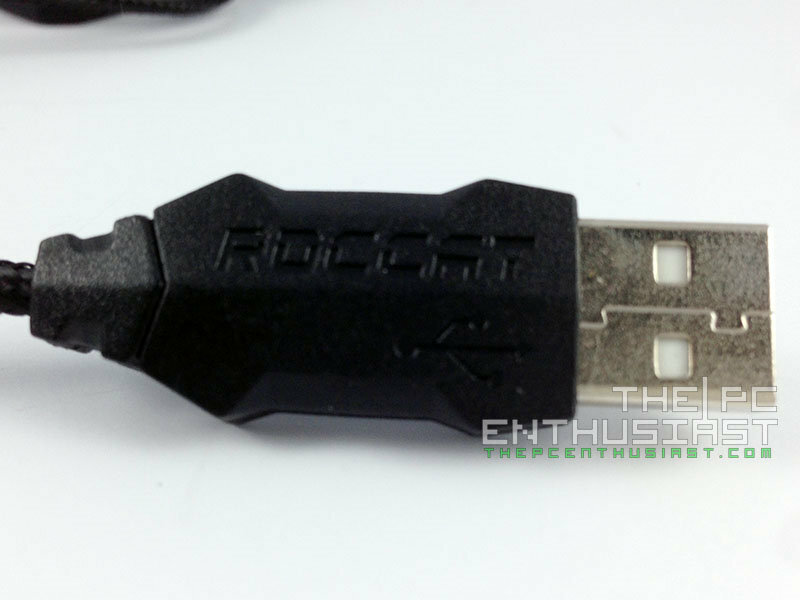 Secondary button function is also possible thanks to Roccat’s Easy-Shift[+] button duplicator. There are a total of 7 buttons plus scroll up and down, and these buttons are fully configurable. 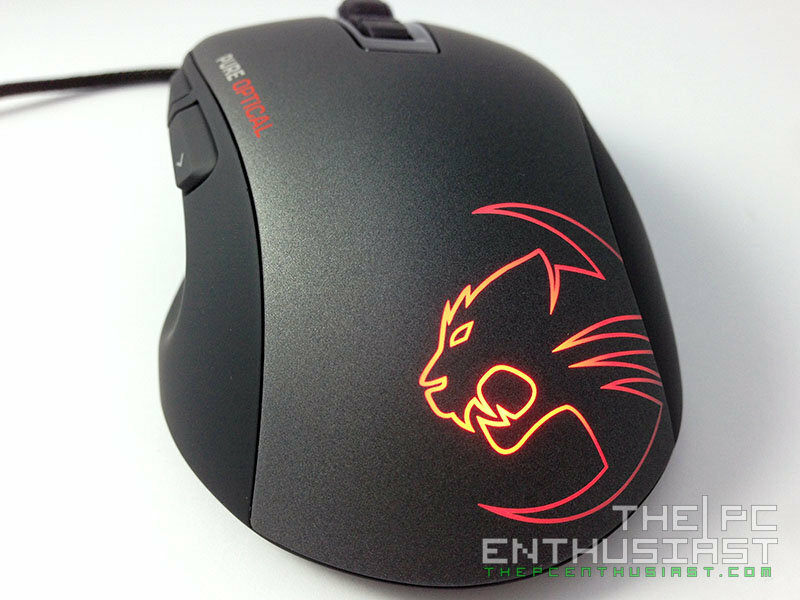 The Roccat Kone Pure Optical also bares the logo of the company with 16.8 million-color lighting system. On the software side, the Kone Pure Optical can be configured via the Driver + Macro manager and supports Talk® and Talk® FX technology. Basically, the Kone Pure Optical is just the same as the Kone Pure, and Kone Pure Color. The main difference is the Kone Pure Optical uses an optical sensor, while the later uses a laser sensor. An optical gaming mouse has lower DPI, usually up to 4000DPI; lesser surface compatibility; and cheaper compared to laser. However there are users or gamers who claim that optical mouse don’t usually encounter acceleration problems, and are said to be better for FPS games. On the other hand, laser gaming mouse is the newer technology. You can use it on a wider variety of surface (unlike optical); it has higher DPI, usually up to 8200DPI; it’s more accurate or precise. 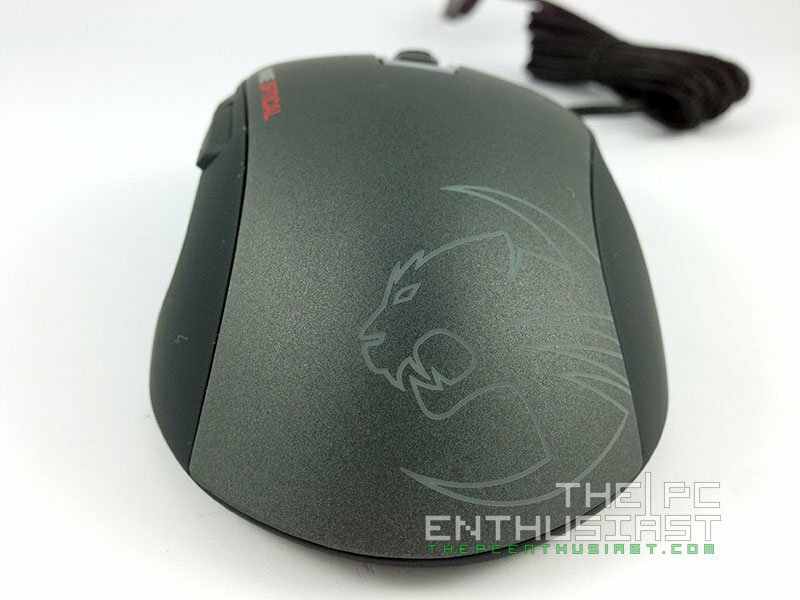 But usually laser type gaming mouse are more expensive and some users claim that laser type are prone to acceleration problems. 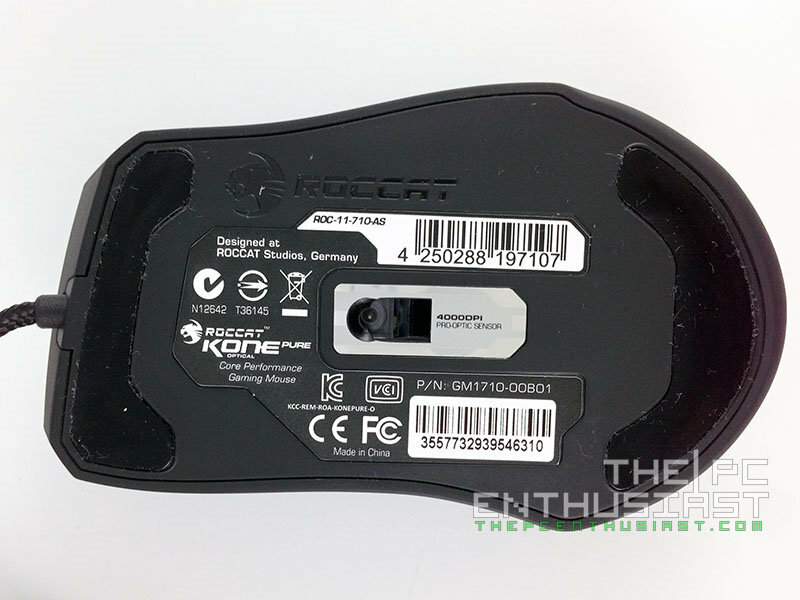 Going back to the main topic, I’ll talk about more of the Kone Pure Optical’s features as we take a closer look at the mouse itself below. 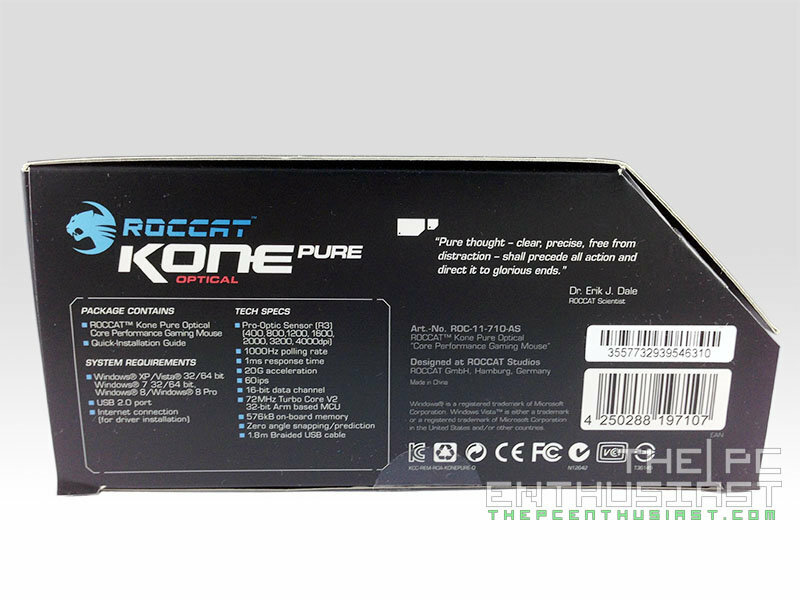 The Roccat Kone Pure Optical comes with the company’s usual well-illustrated packaging. Most of its features are imprinted in front and the rear portion of its box. Additional features can be read from its side and top portion of the box. Meanwhile specifications and system requirements are located on the bottom portion. The front cover of the box can be opened so that you can see the actual product itself. You can also try and fit your hand to see if it’s small or just right for your hand. Of course, the Kone Pure Optical’s surface feels a lot better compared to just “feeling” it with the plastic cover on. More information about the gaming mouse can also be read behind its cover. 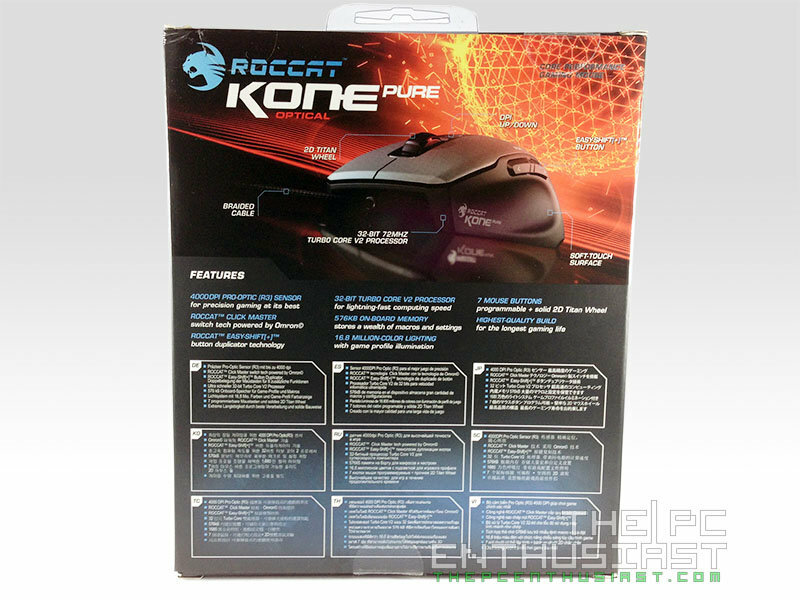 The box contains the Roccat Kone Pure Optical mouse itself and a quick installation guide. 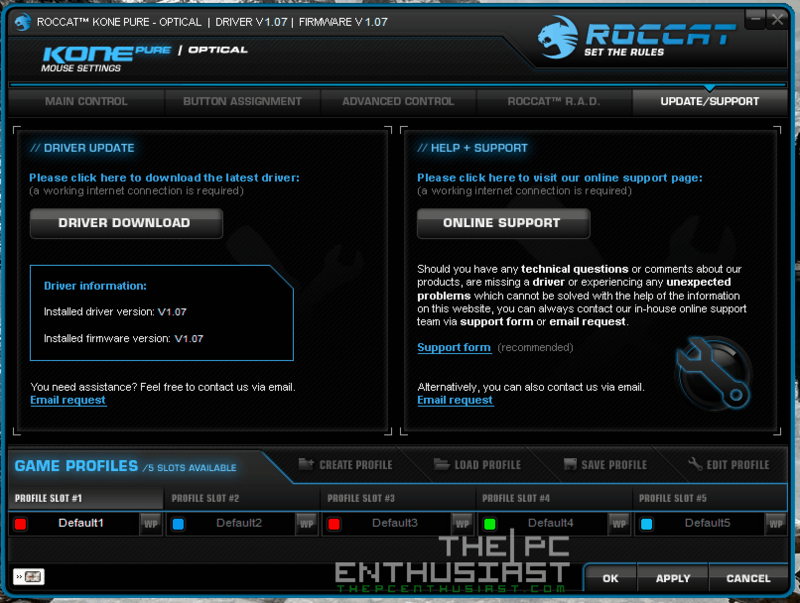 There’s no driver CD since you can download the latest version from Roccat’s site. By removing the driver CD, this could probably help the company lower the overall cost of the product. 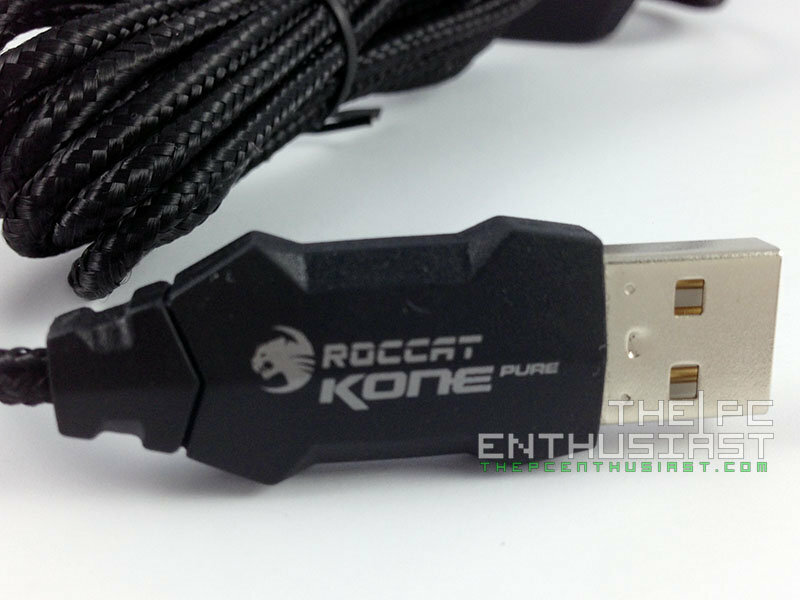 The tip of its USB cable is not gold plated but it comes with a stylish body. Just like most premium gaming mouse, it also features a braided cable. Above are the left and right side views of the mouse. It has a maximum approximate length of 12cm and approximately 4.5cm on its highest point. 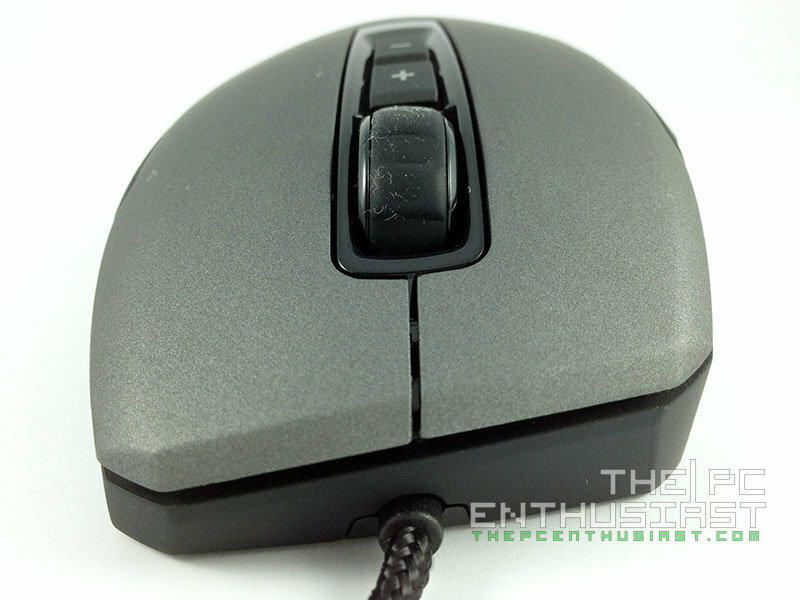 The Kone Pure Optical mouse does not have an ambidextrous body, rather it’s made for right handed users. There are two buttons for the right thumb, and no additional buttons on the other side. The Kone Pure Optical features Roccat’s Titan Wheel featuring 3kg push force, 24 steps per cycle and new advanced encoder. At the back of the mouse, you can see the company’s logo. From the top view you can see the + and – buttons for adjusting DPI or volume up and down via the Easy Shift key. At the bottom of the Kone Pure Optical you’ll see two large feet, product code, serial numbers and the optical sensor. The logo at the back of the mouse is backlit and you can change the color of the light via the software. You can also make the light constantly turned on, or off, or in breathing mode. Now let’s take a look at its software. 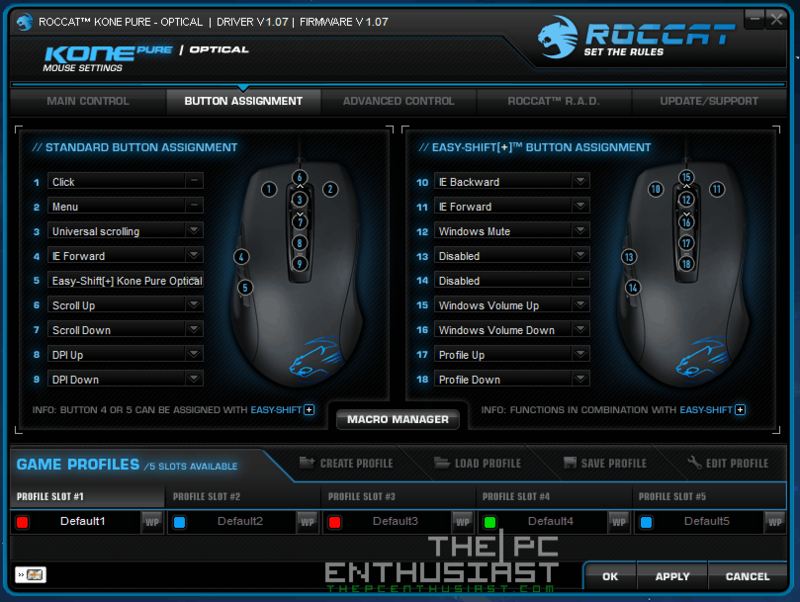 The Roccat Kone Pure Optical’s driver software can be downloaded from the company’s support page here. There are 5 main menus in the software. In the first menu you can change the sensitivity of the mouse, scroll speed, double click speed, tilt speed as well as change the DPI settings. You can save up to 5 different profiles for your mouse. In the second menu is where you can configure the individual buttons as well as the equivalent Easy Shift[+] command. In the third menu is where you configure the effects and color of the logo at the back of the mouse, as well as its polling rate. The software also comes with voice feedback, so if you don’t want to hear any voice notification you can control it here. Unlike other gaming mouse’s software, Roccat has this cool feature called R.A.D. 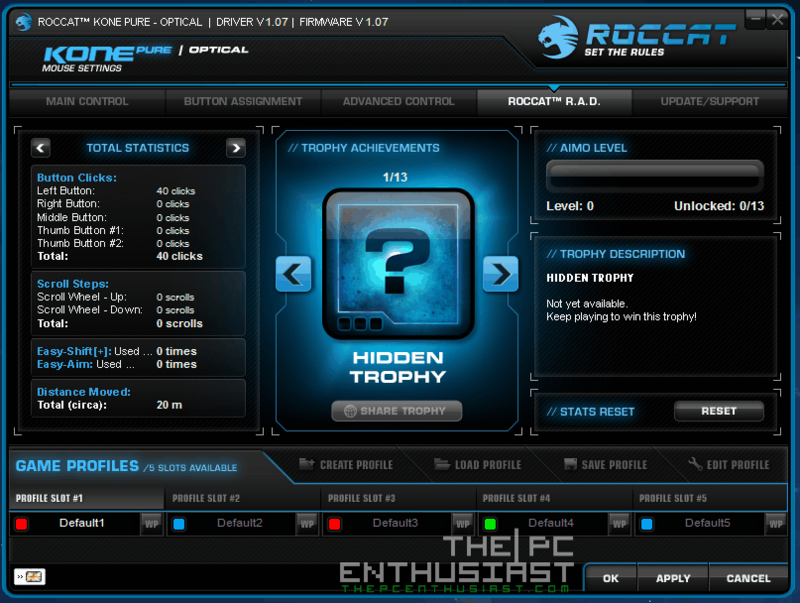 or Roccat Achievements Display. According to Roccat, R.A.D. is a fun and useful application that tracks and rewards a wide range of gaming feats. The app compiles your mouse use data, provides a range of statistics for analysis, and hands out trophies when you hit exceptional milestones. It’s an entertaining way for you to keep track of your mouse skills, and it even lets you share your accomplishments with others via social network sites, like Facebook. Finally the last menu is for update and support. If you want to check if you are running the latest driver you can do it here. Or if you need some technical assistance, you can access online support via this menu. 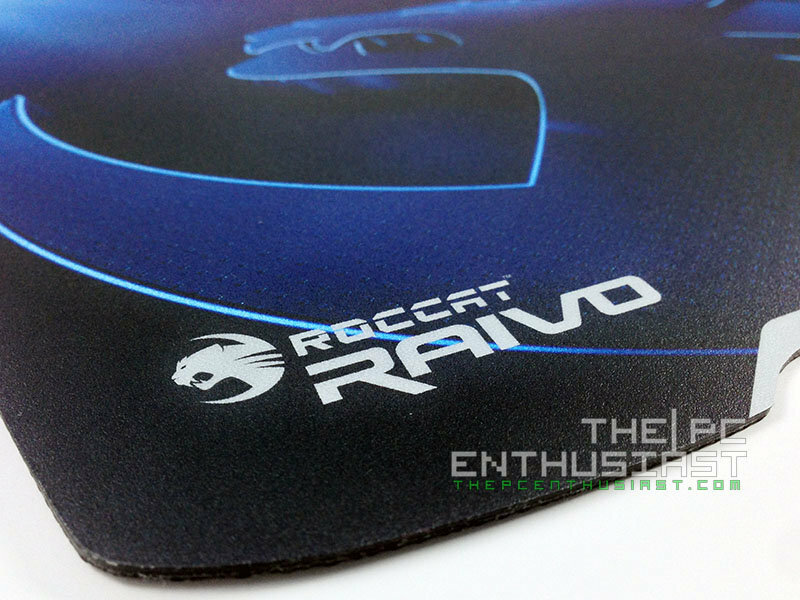 Roccat has a wide range of gaming mousepad, and one of them is the Raivo. 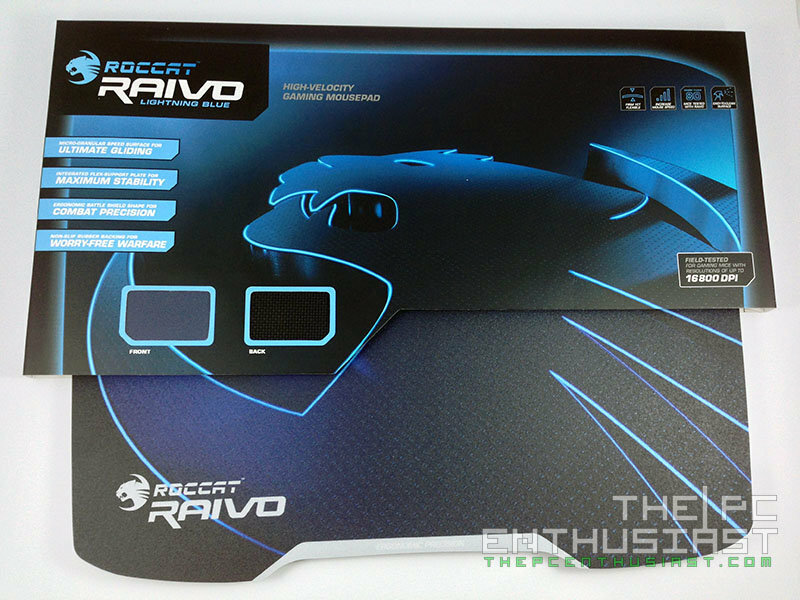 The Roccat Raivo is a high-velocity gaming mousepad that features micro-granular surface, an integrated flex-support plate and a non-slip rubber base. It has an ergonomic battle shield shape design, and its surface has dirt-resistant coating. Let’s take a closer look at the mousepad below. 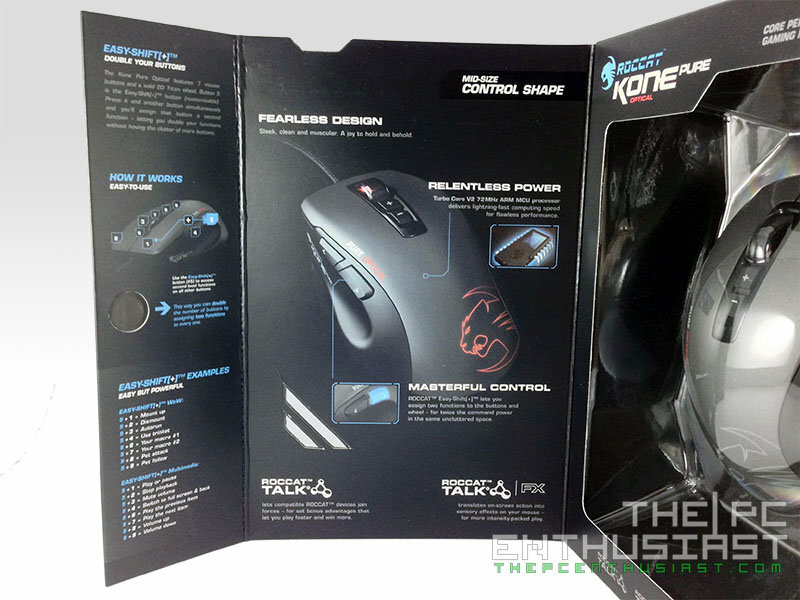 The Roccat Raivo comes in a very simple packaging and is protected by a transparent plastic shell. 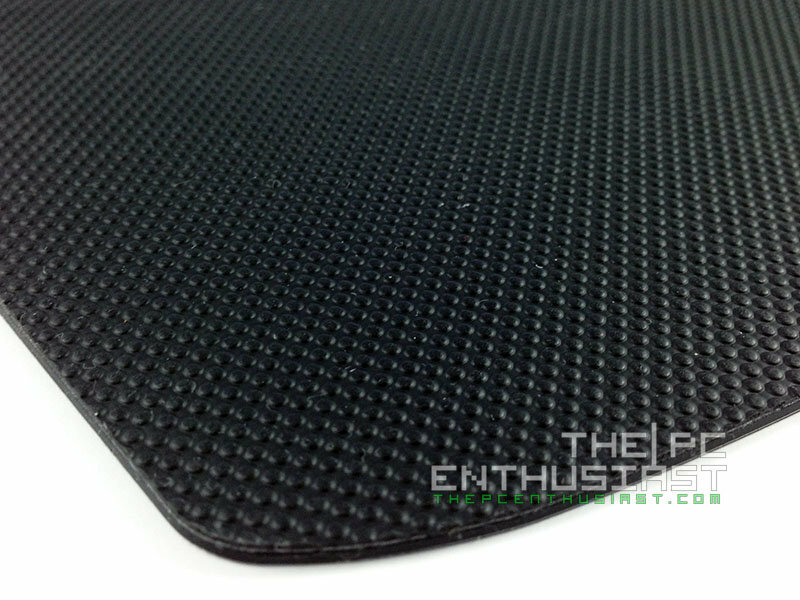 In front you can see two sample textures of the front and bottom surface; and it’s also indicated that the Raivo is tested to support up to 16800DPI. Now, that’s a lot of DPIs. At the back of the packaging is a list of the mousepad’s features, as well as a list of compatible gaming mouses. The Raivo gaming mousepad has a dimension of 350mm x 270mm x 2mm, making it just the right size for most PC gamers. This model, by the way, is the Lightning Blue variant, and it’s also available in Midnight Black and Stealth Black colors. 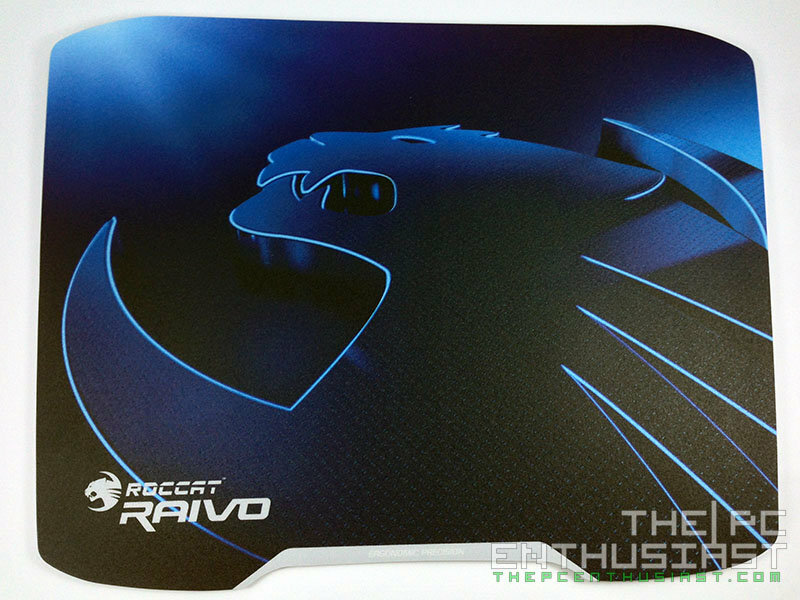 The Roccat Raivo is composed of three layers: the granular surface, the flex-support plate that makes this mousepad sturdy, and the rubber base. You can’t clearly see it from the pictures above, but in real life you can see the three layers. My only concern is, how long before we see these three layers starts to separate from each other due to wear and tear. I have been using and testing the Kone Pure Optical for several weeks now and so far so good. It feels good to click, and the buttons on the thumb side can be easily accessed as well. The scroll wheel works great but it does produce a certain amount of noise that some people might find it annoying, specially if you keep scrolling up and/or down rapidly. 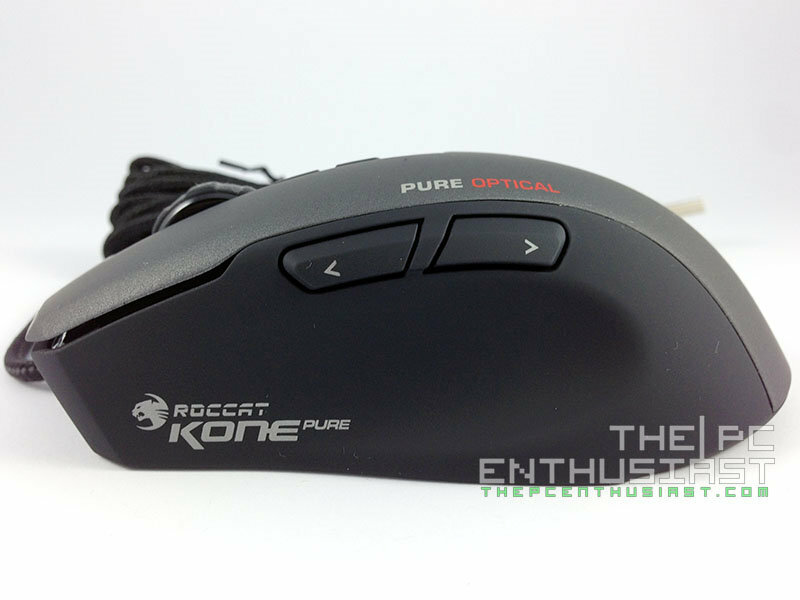 I tried playing several FPS and RPG games with the Kone Pure Optical and it was a great experience in general. However, I do have a large palm and I find the Kone Pure Optical a little bit small for my hand. It took me a while to adjust since I am used to larger gaming mouse. But once my hand got used to the shape of the Kone Pure, then that’s it. But if you have a smaller palm or hand, then it might fit you perfectly. I almost forgot to mention this; the Kone Pure Optical has a rubberized surface texture, including its sides. But even though it’s rubberized, the feeling is somewhat smooth and silky. Personally I like the feeling because it’s smooth and very nice to touch. However, I don’t think that other users will be happy about this type of surface. Some might find their hands slipping off, but for me the surface is just right. 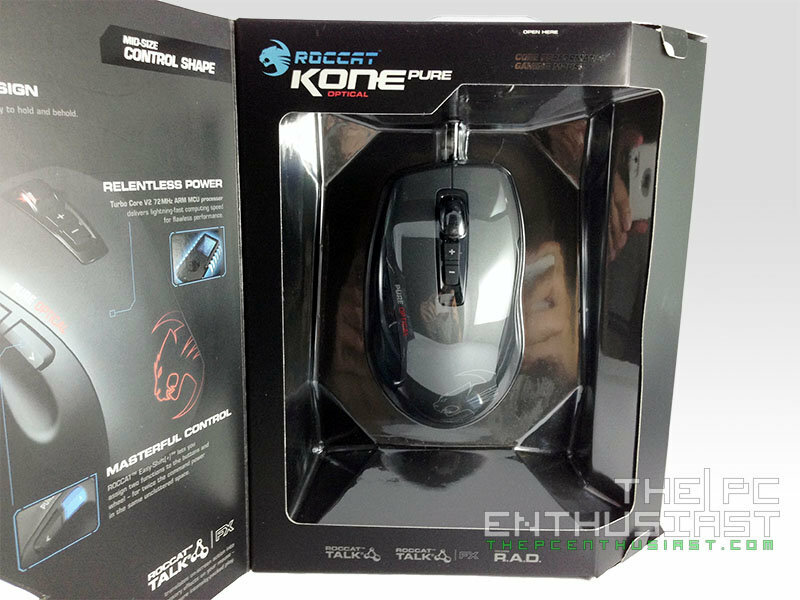 Now, using the Roccat Kone Pure Optical with the Raivo mousepad was even better. I usually don’t use this type of mousepad because you can’t roll it and you have to place it on an even flat surface. But once you have tried the combination, you might find it to your liking. I was able to frag better with the Raivo, and not only in gaming, editing photos was also a great experience since it helps the mouse to perform with precision compared to other mousepads (soft, cloth and silicon mats) that I have tried. 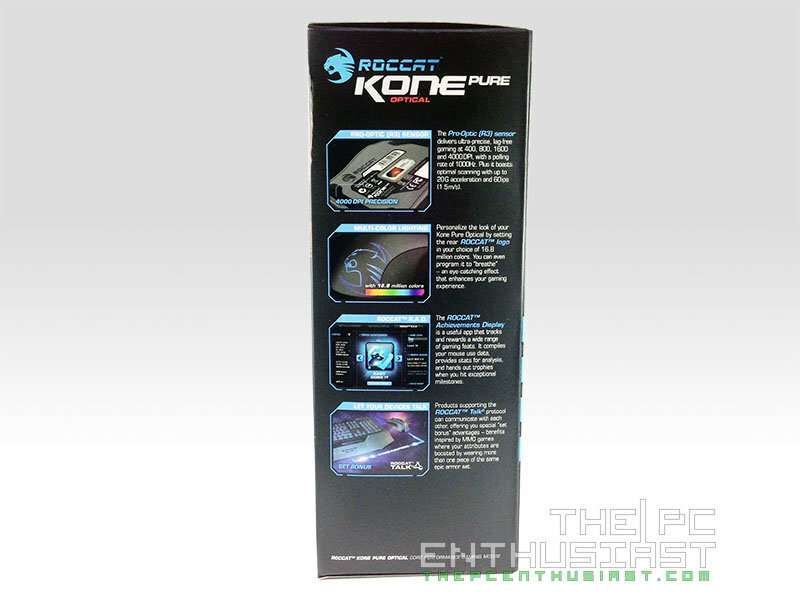 The Roccat Kone Pure Optical (ROC-11-710) and the Raivo gaming mousepad are widely available. Currently, the Kone Pure Optical has a retail price of $61.24 here. Meanwhile the Raivo Lightning Blue has a retail price of $25.43 here. Same price applies to the Raivo Lightning Midnight black and stealth black. Meanwhile, the Kone Pure Optical comes in different colors or theme like Camo Charge, Desert Strike, and Naval Storm. You can check them out here. 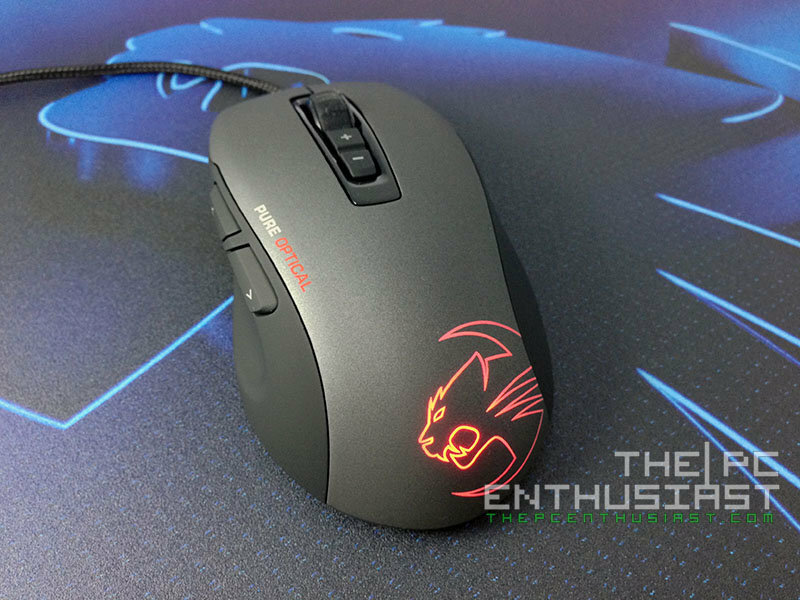 The Roccat Kone Pure Optical is one well-built gaming mouse, without bombarding it with tons of buttons. It features 4000 DPI which I think is great for gaming, specially for FPS. I also like its software, specially the R.A.D. since you get to track how many clicks or how far the mouse did already traveled. It’s also nice that you can fully customize the color of the light of the logo and control its lighting effects. I also like the smooth rubberized texture of its surface. If there is one thing that I did not like about the Kone Pure Optical is that it’s small for my hand. 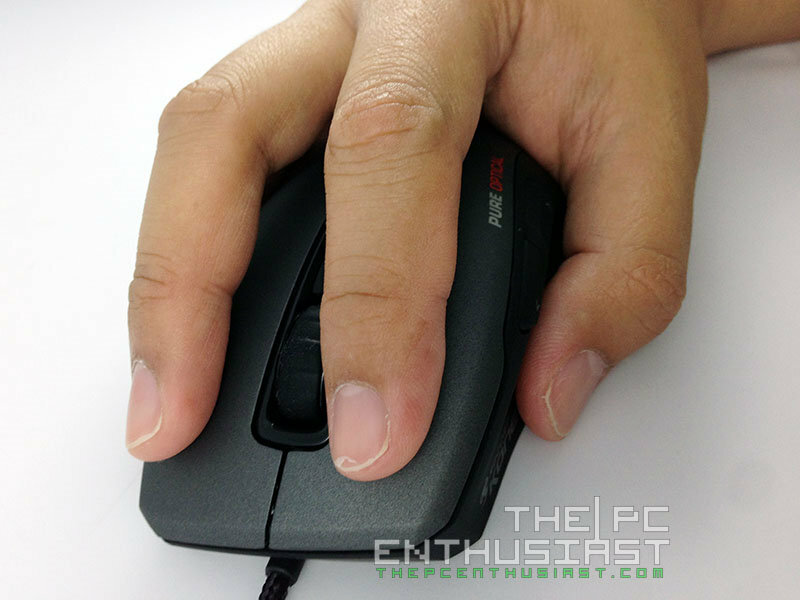 Roccat could also make the scroll wheel a little bit silent when being scrolled and they could at least make the lift of distance shorter. During my test with the Kone Pure Optical, it was working properly and didn’t misbehave at all. 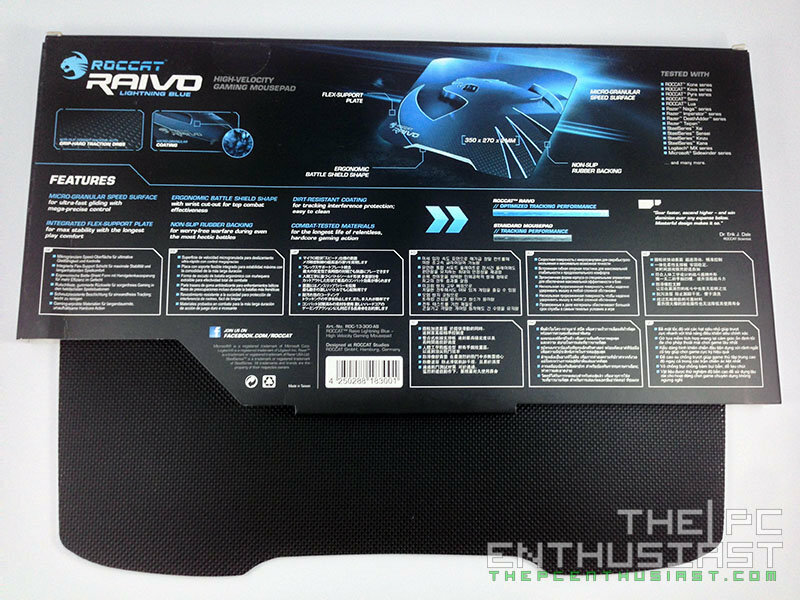 The Roccat Raivo mousepad was a great partner as well. The mouse moved flawlessly with precision thanks to the Raivo. The only thing that I wasn’t able to test was the Roccat Talk feature. You’ll need a matching keyboard, like the Roccat MK series, to take advantage of this feature. 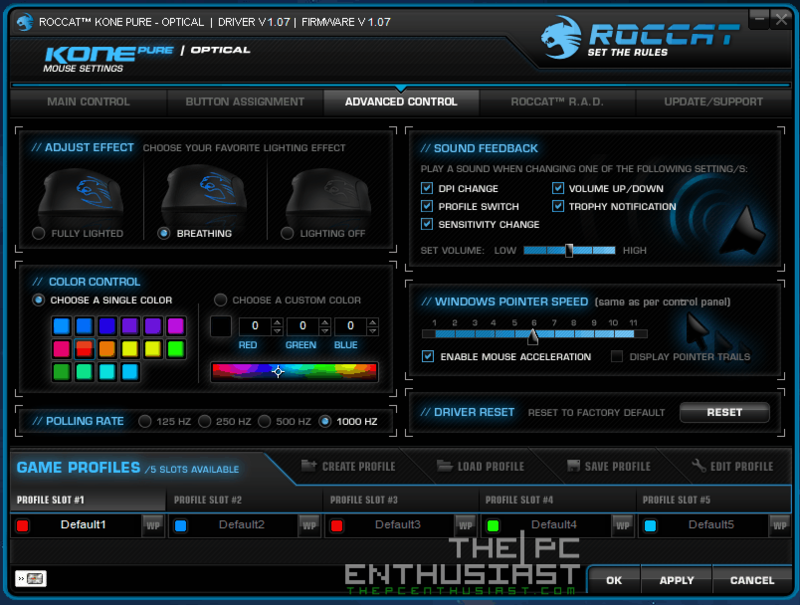 Hopefully I can review one in the future and demonstrate the Roccat Talk feature to you. At the end of the day, a gaming mouse and mousepad is really a matter of personal preference. 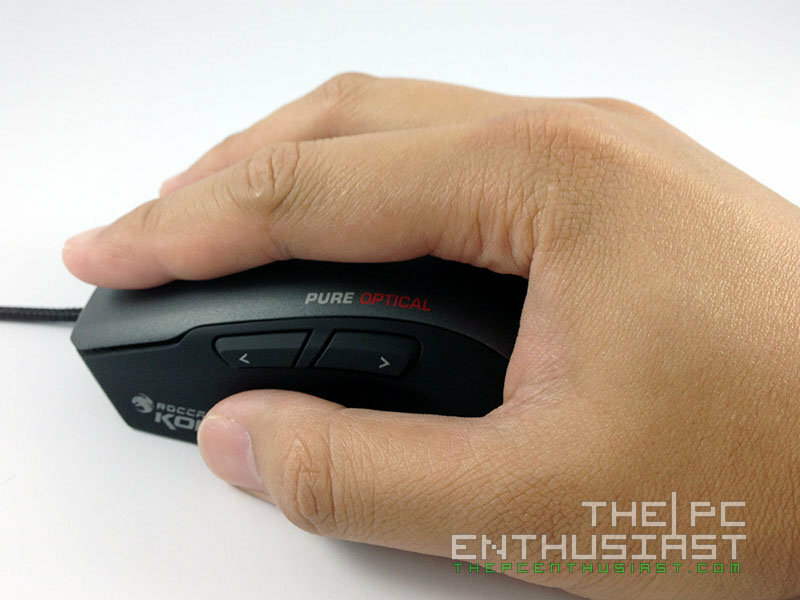 You might find the Kone Pure Optical too small for your hand, or its surface type might not be ideal for you, or you might need an ambidextrous mouse instead. 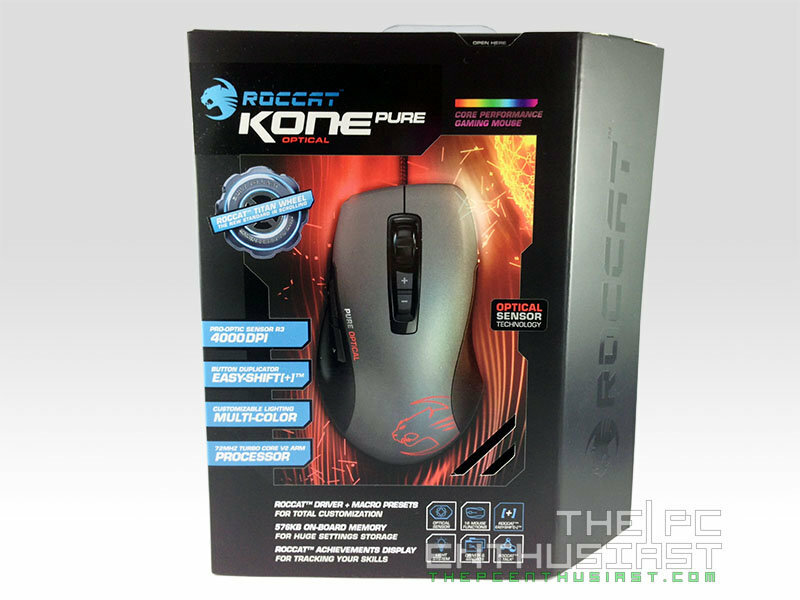 But if you are looking for a gaming mouse in which the Roccat Kone Pure Optical fits your description, then you might want to consider this gaming mouse instead. 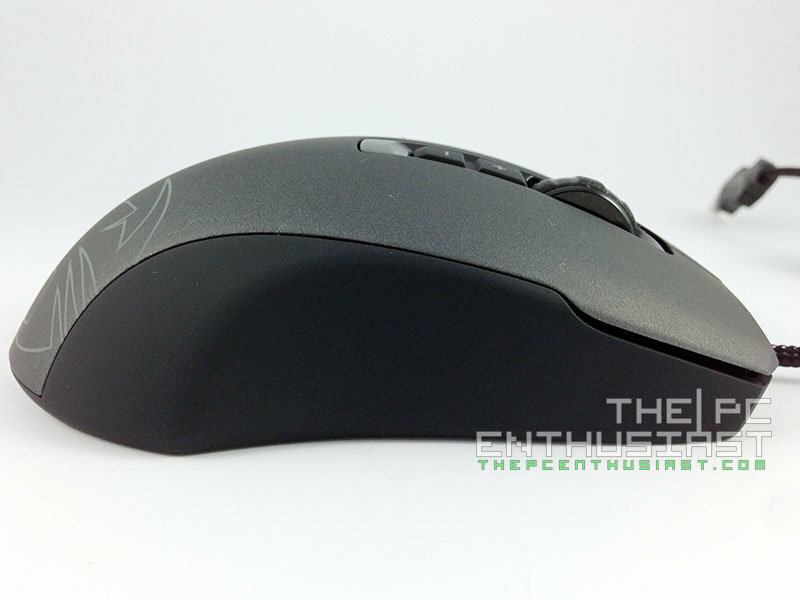 It’s definitely a mouse designed for gamers, with the enough function and features to meet most gamers’ needs. Undeniably, it is somewhat priced higher compared to the other premium gaming mouse out there, but I think it’s just right considering the features and the quality of this product. If you are looking for a gaming mouse and a mousepad just like the Roccat Kone Pure Optical and Raivo, I suggest you add them to your options because both are great products that don’t disappoint. Both products deserve The PC Enthusiast’s Highly Recommended Award.